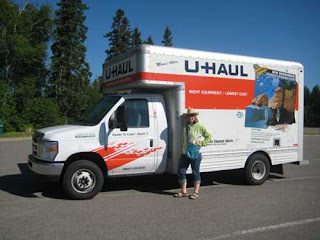 June 7th Andria and I departed Ottawa in a 14-ft Uhaul truck, complete with 6 wheels, Mother’s Attic and lots and lots of stuff. 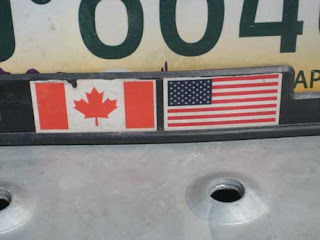 We noticed the licence plate fittingly – since I’m a Canuck and Andria’s from the States – had both Canadian and American flags. 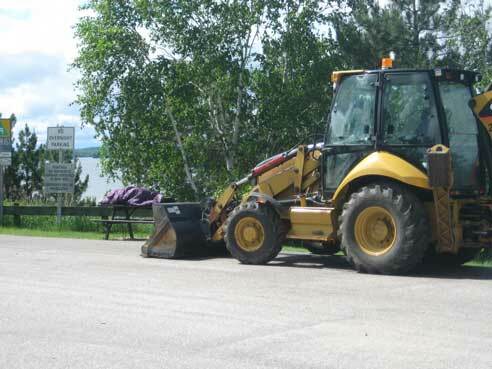 We decided this was a something of a two-nation frienship tour across northern Ontario and the Prairies… and since we had only intermittent radio signals and no CD player or Ipod hook-up, this eventually led to a discussion about relations between our two great countries. 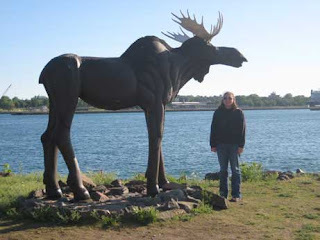 We made a few friends along the way, including this large moose in Sault-Ste-Marie (The Soo) and I got to revisit my ol’ pal the Goose in Wawa. As this picture shows, though, Canadians may not deserve their reputation for friendliness. the new Earl’s in Winnipeg has scrumptious edamame and a soup/salad combo. 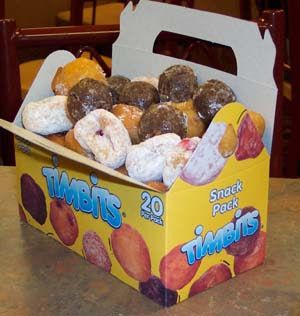 One great thing about living in the West is we’ve got ’em all over the place! (Don’t worry, Andria, there’s one in Denver too!). CBC Radio sounds like home, although NPR rocks too! Especially hearing K’Naan and the Young Artists for Haiti singing ‘Wavin’ Flag’… I was captivated by one female vocalist at the end and it turns out it’s Nikki Yanofsky, a 16-year-old jazz singer from Montreal. Incroyable! We arrived in Edmonton completely done with driving and U-hauling. Initially we’d thought of going for a hike in and around Jasper before Andria flew home, but after 5 solid days of bum in seat the last thing we wanted was to be back in a moving vehicle for any length of time. Instead, we went to Elk Island National Park, a 30-minute hop east of town. While we saw Bison on the edges of the park (from the road) once we were on the trail Riker was the biggest fauna we encountered. Unfortunately I couldn’t convince Andria to pull up her Wyoming roots and move to Edmonton, but I think the beers and breakfasts (among other things) might woo her back for visits!